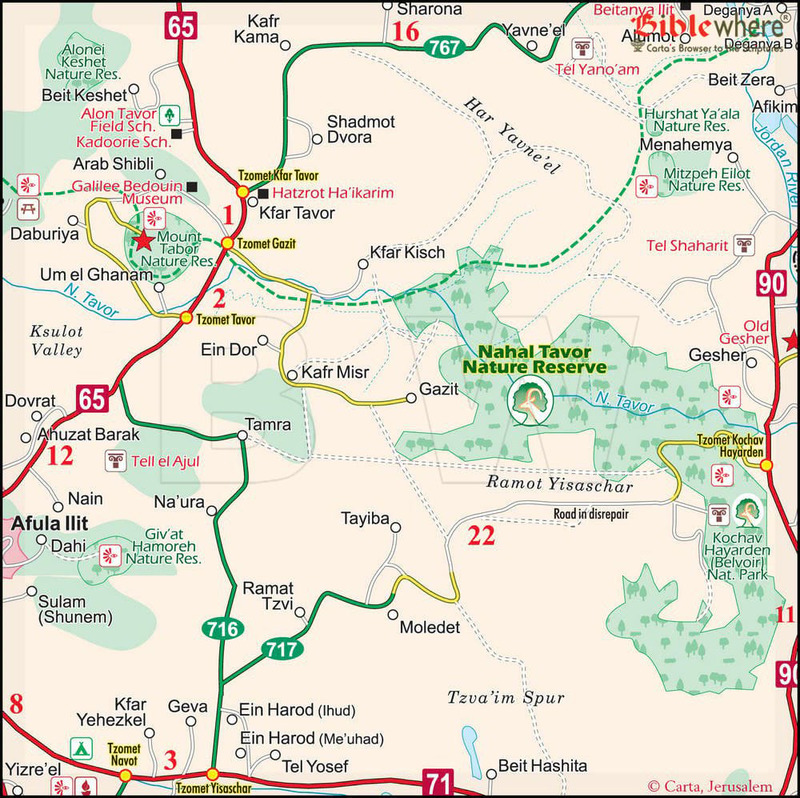 Nahal Tavor is the largest Nahal in the southwest area of the Lower Galilee. It begins at the base of Mt. Tabor and continues southeast emptying into the Jordan River. 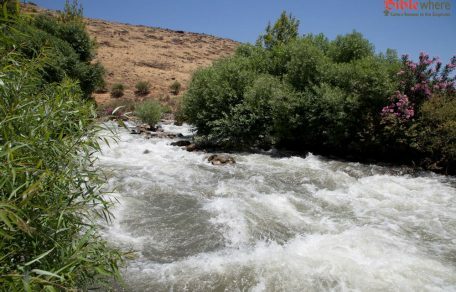 The upper part collects water only in the winter, but later on several springs emerge, and in its lower section, from Ein Shahal and beyond, there is flowing water throughout the year. The Nahal bed still reveals remains of an aqueduct and water mills. Along the length of the Nahal is a pipeline which brought crude oil from Iraq to the refinery in Haifa Bay. The section of the Nahal from Tel Rechesh to route 90 in the Jordan Valley has been set aside as a nature reserve and its deep bed forms a startling contrast to the plateau landscape on either side of it. There are no special elements in Nahal Tavor. It descends between two plateaus, Tavor and Yisaschar, at a depth of 200–250 m below their respective heights. The sides of the Nahal are composed of basalt rock and on the northern bank there is a stratified deposit of gypsum. To the east of the Reserve, looming above the south bank of the Nahal, is the Kochav HaYarden fortress. The preservation of this reserve is justified on the basis of its springs, flora and fauna. The Nahal Tavor Reserve lies on an axis bridging the Mediterannean frontier with the steppe land region. In the winter and spring, the rains bring about a greening of its banks and an abundance of flowers. Especially noteworthy are the Blue Lupines (Lupinus pilosus) appearing on the higher sections of the Nahal. In the upper areas of the south bank are cyclamens and the rare purple-colored Vartan’s Iris (Iris vartanii). Most vegetation dries up in the summer bringing into relief the remaining perennial greens of the Judean Bird’s-foot Trefoil (Lotus collinus) and Christ’s Thorn Jujube (Ziziphus spina-christi). One of the special features of the Nahal is the large concentration of White Acacia (Acacia albida): this is a tropical tree of which there are several groupings in the country at some distance from each other: in Shimron in the Lower Galilee, in Nahal Ha’ela in the Judean Hills, and beside the town of Ashdod. 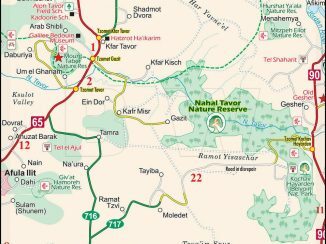 The largest concentration occurs in Nahal Tavor: a significant grove with trees spread out along the slope may be seen where route 90 intersects the Nahal. The leaves of these trees fall in winter and turn green in summer. 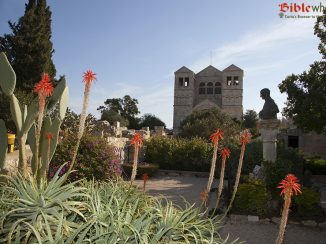 In the Nahal bed, beside flowing or still waters, are the riverbank plants: Tamarisks and Willows, oleander, the Lilac Chaste tree (Vitex agnus castus), and other water-side plants. This section of the Nahal is a gathering point for various species of animal life. Nahal Tavor with plateaus on either side of its banks is the main habitat for the Israeli gazelle. The gazelle population in this area numbers in the hundreds and in some seasons has reached counts in four figures. In years of high fertility, neighboring farm land has been adversely affected. The gazelles are active during the day and are thus quite visible. In the spring mating season, females are accompanied by their fawn, and it is not uncommon to encounter herds of young stags. Few people are indifferent to the sight of gazelles bounding about in their natural environment. These animals are not dependent upon flowing water; they can obtain the required amount to quench their thirst from plants, even from those that appear bone dry, and can live for two or three weeks without drinking. Nevertheless, from time to time they also partake of the water found in the Nahal. The Reserve also serves as a grazing land for cattle, thereby heightening a conflict over food. Both the domestic cattle and the wild gazelles face the danger of predators in their territory: jackals and foxes found here lie in wait for the fawn, and the wolves, which appear occasionally, hunt calves and even mature cows. The aforementioned factors engender a confrontation be-tween the farmers and the protectors of nature. Hyraxes and hares appear occasionally, and the existence of porcupines, which are night animals, can be verified by the presence of their dens and the quills strewn about. Among the birds to be seen here are partridge, especially in the spring when they strut about with their covey of young. In the past, there were many birds of prey in the area. When this site, in the upper sector of the Nahal, was surveyed, archaeologists found considerable remains of occupation: flint tools from the early Stone Age and periods following it, Egyptian seals, and various items from the Iron Age. A natural trail whose length is some 6 km. It begins and ends about 500 m northeast of Kibbutz Gazit. The path traverses a basalt canyon, passing by pools and small waterfalls. In the spring, the basalt slopes are covered in a delightful carpet of Blue Lupines (Lupinus pilosus). 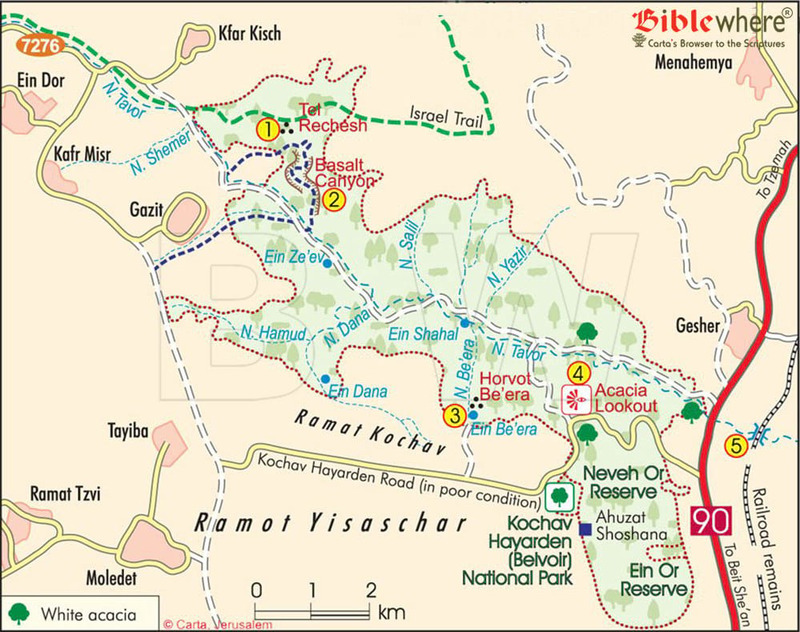 This hiking trail begins at the intersection of route 90 and the road that leads to Kochav Hayarden. It passes through the Ein Be’era (spring) and Horvot Be’era (ruins) and finally meets Nahal Tavor. There is a tradition that Jotham the son of Gideon, after he recited his famous allegory designed to undermine the standing of Abimelech, the city’s king (Judges 9:21), hid from the men of Shechem in this area. Nahal Be’era has two springs, Ein Be’era and Ein Shahal. An observation point located in the midst of a concentration of white acacia trees. It is on the road descending to Nahal Tavor from Kochav Hayarden. On the lower portion of the Nahal there is a handsome stone bridge upon which trains once crossed from Beit She’an to Tzemah. 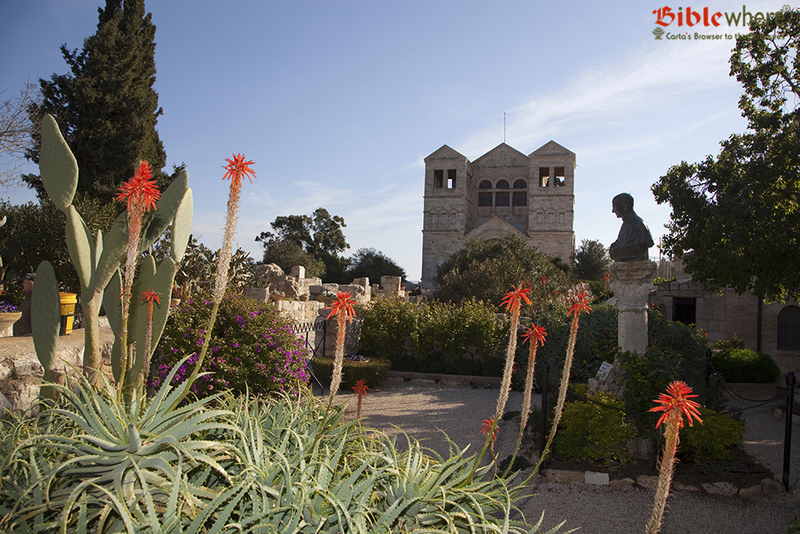 “Surely as Tabor is among the mountains and as Carmel by the sea” (Jeremiah 46:18). Tabor was one of the towns allotted to the Levites in the territory of Zebulun (1 Chronicles 5:62). 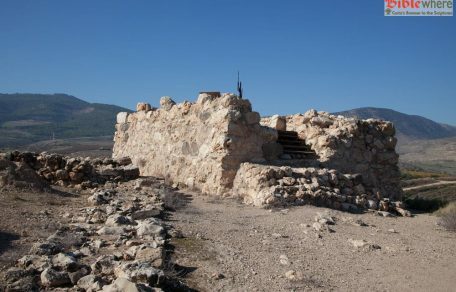 During the Second Temple period, Josephus built a new fortress on the mountain with a 3-km-long defense wall. Remains of this fortress, which was captured by the Romans, may be seen at the summit. The settlement was renewed after the Jewish Revolt and assigned to the priestly division of the house of Aphses. In the Byzantine and Crusader periods, several monasteries were built on the summit but were destroyed by the Arabs. According to the Christian tradition, the Transfiguration of Jesus took place here in the accompaniment of several Apostles and thus the Christians call it the Mount of Transfiguration, although the specific attribution to Mt. Tabor does not occur until the 4th century. 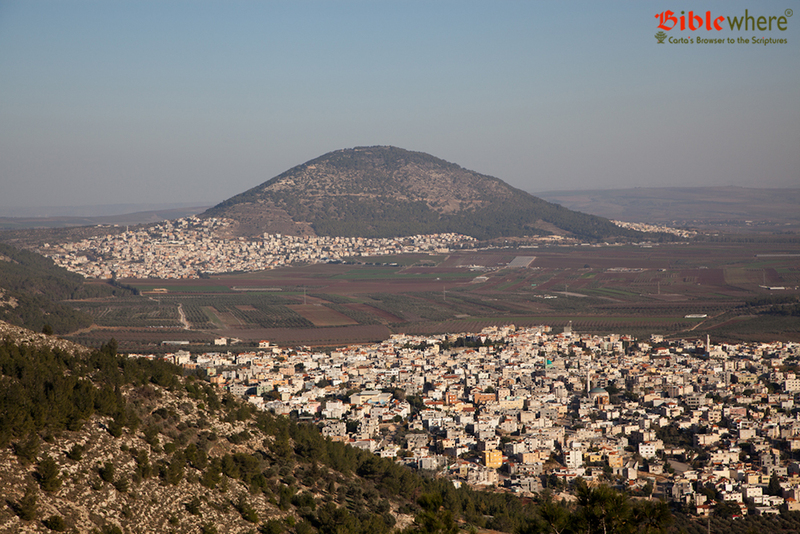 It is at this time that the tradition of Christian pilgrimage to Mount Tabor began. 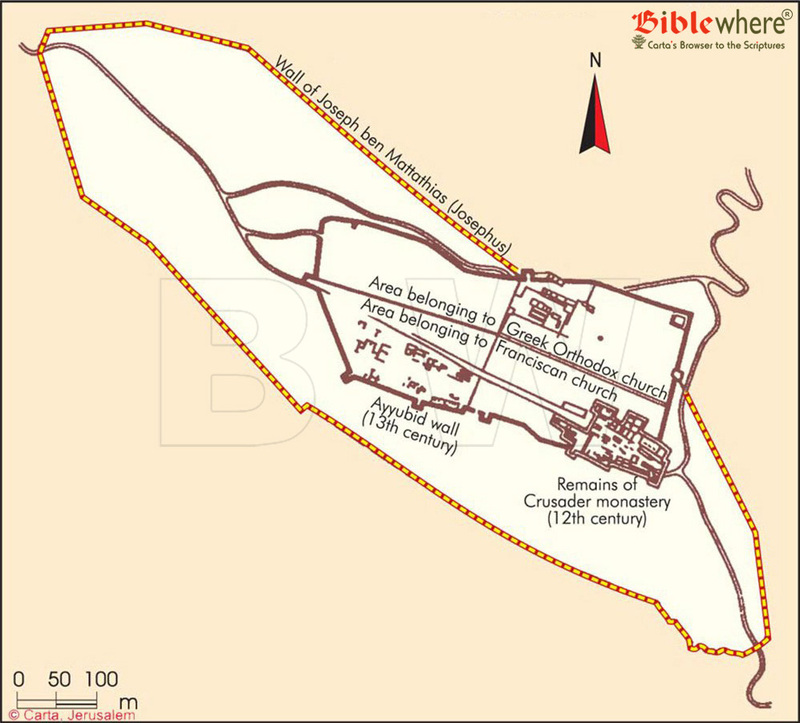 The pilgrims built a large monastery and fortress on the summit of the mount which were subsequently destroyed during the Arab conquest (638 AD) and then rebuilt by the Ayubbid sultan, al-Malik al-Adil in 1213. The Mamluks destroyed it in 1263 and it remained deserted until 1631, when monks of the Franciscan Order occupied the area. In 1873, this Order built a small monastery at the summit and since then there have been additions to the building. Access to the summit may be made by taxi or by foot from the base of the mountain where there are paths on all sides. Giv’at Hamoreh is situated in the Jezreel Valley to the east of Afula at an altitude of 515 meters. 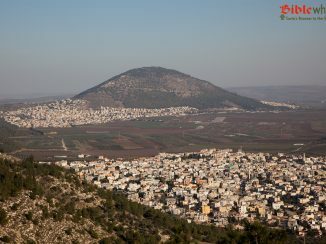 The Hill of Moreh is described in the biblical account of Gideon’s war against the Midianites (Judges 7:1). The Arabic name for the mount is Jebel ed Dahi, after a 7th-century Muslim saint whose tomb was built on the summit. It is also known as “Little Hermon,” a nickname given to it by Christian pilgrims in the Middle Ages, drawing upon the biblical passage “Tabor and Hermon rejoice in Thy name” (Ps 89:13).